Cisco has a new awareness of the potential contact center has to grow its entire collaboration business. At its Collaboration Summit last week, Cisco contact center executives, including VP and GM Vasili Triant, provided a deep dive on the Customer Journey Platform. First, what is Customer Journey Platform (CJP)? Today, it is primarily the new name for BroadSoft's CC-One solution (shown in the upper left of the diagram below). Cisco is working to incorporate elements of Spark Care and other components of a next-generation customer care solution that the Cisco customer care organization team had been working on to expand CJP. 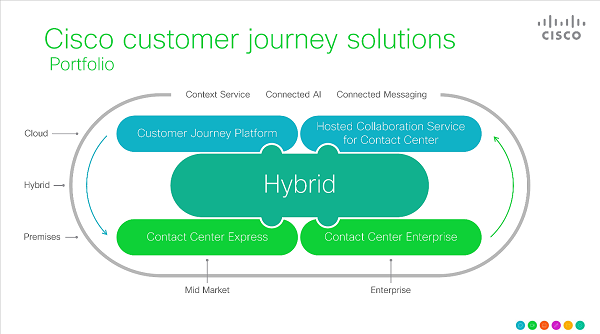 You'll note that the new customer journey branding has been extended from the mid-market cloud contact center solution to the entire Cisco contact center portfolio. It is also being used to change the very name of what was "Cisco Customer Care," now "Cisco Customer Journey Solutions." Another element of the above graphic that is new, and worth explaining, is the hybrid block in the middle. Perhaps the most important ingredient of Cisco's strategy to migrate its existing collaboration customers to the cloud is the Collaboration Flex Plan (formerly Spark Flex Plan). Introduced in November 2016, Flex is a subscription-based contract that allows companies to mix and match cloud, on-premises, and hybrid solutions. Never before available for contact center solutions, Flex comes to Customer Journey Solutions in the fall of 2018, and it comes in a big way. Customer Journey Platform will only be available through the Flex Plan. This certainly is in keeping with an overall Cisco Collaboration strategy for Flex to be the primary pricing model for the portfolio at some (undefined) point in the future. At the same time, Flex is a plan that allows Cisco to move existing customers from premises to the cloud. An existing Contact Center Enterprise customer can now choose to move to Hosted Collaboration Service -- Contact Center (HCS-CC) and receive credits for its existing CPE licenses, easing the transition. One existing Cisco Contact Center customer mentioned during a panel for analysts that the same type of credits will be available for the replacement of competitor CPE with Cisco HCS-CC, something that he said will accelerate his replacement of existing, aged contact center equipment. The Flex Plan will offer an existing Contact Center Express customer a path to the cloud that has been virtually non-existent within the Cisco portfolio until the acquisition of BroadSoft. The availability of these financially-attractive migration paths may prove to be a bonanza for Cisco. According to Triant, as he has met with major Cisco contact center customers since he came on-board, customers have voiced the sentiment that they haven't yet moved to contact center as a service (CCaaS) because, "We are waiting for Cisco to give us a path to the cloud." As former CEO of Serenova, Triant says that just a few weeks talking to Cisco customers has given him an appreciation of Cisco customer loyalty that he didn't have before. At three million agent seats, Cisco could post the kind of 20% to 25% growth in contact center revenue being posted by CCaaS competitors without breaking a sweat, just by migrating its own base. One of the comments made by Triant in his opening comments to the contact center analysts -- that resonated with the group -- is that the total CCaaS addressable market is more than just a function of the number of premises agent seats that still remain (arguably ~13 million). Solutions from NewVoiceMedia ( ContactWorld for Sales) and Talkdesk (Talkdesk for Sales) highlight that in a cloud world, marketing and sales employees can derive value from functionality traditionally thought of as "contact center." CRM integration, preview outbound dialing, and scripting are just a few of the capabilities that can be sold to these job titles, a net-add to the total market that can be addressed with contact center solutions as they move to the cloud. Cisco's contact center business has seen steady growth over the past few years, exploding in North America in 2017 largely driven by the Avaya bankruptcy. According to Triant, the entire leadership team -- from Chuck Robbins to Rowan Trollope -- has a new awareness of the potential contact center has to grow the entire collaboration business. It will be interesting to see how that new-found enthusiasm translates into strategy and execution.